.. dip in water, smooth on wall or door. app/frd as dirccled, or money back. cat, 70 in. tall. Bloopy Blue umbrella; Overly Orange tie and stripes on hat. cotton with comfortable kapok filling. 22 in. high. pounds 15 ounces.. . . . . Choice of 4 Dr. Seuss colors. colored pillow. 15 in. long, 10-in. corded knife edge; hand washable. diam. Shpg. wt. 1 lb. 10 oz. 12 inches square. Shpg. wt. 12 oz. 24 N 18192H .. . .
ing or with screws (included). Operates on 4 "C" size batteries (included). Blue background color. 87l!x871!x2Ys inches deep. 57 N20245--Shipping weight 4 pounds 4 ounces. . .
from catalog order plant. Xo C.0.D. "s on factory items. /hen inside or outsidr brMkcls. Ad justable Cafe Rods. 1-in. diam. enameled steel. Brackets, hardware incl. way. Wood frame with painted lacquer gloss finish. !\o glass. 17x37 in. high.
" The 1-2-3's." Bloopy Blue frame. frame. Shpg. wt. 11 lbs. crush, fabric-backed vinyl .. loosely filled with exi>andecl styrene beads. 1 N55170 NH-Freight (rail or truck) or express. Shpg. wt. Vertie the Turtle. Natural-color handwoven rattan over hardwood frame. size, 32x16x2071! in. high . Pick up your phone right now and order this one! 1 N98400N-Freight (rail or truck) or express. Shpg. wt. 20 lbs..
(multicolor combination of above Sears colors). 21 N5908N-Shipping weight 12 pounds. heights. Grinch Green frame. No glass covering. llx53 inches. vinyl; Dr. Seuss design and bright Multi-Mix-Upps (multicolor) on wh ite. Metal reinforcement. Ventilated back. Padded lid can be used as seat . 5685L-Shipping weight 15 pounds. .
Multi-Mix-Upps (multicolor) print. 10Ysx771!x13 inches high. 96 N5686-Sbipping weight 2 pounds 12 ounces. . .
Bath Rugs of soft cotton pile with latex back for skid resistance. Machine wash and dry, medium temperature. ABC Animal Print. Cheerful Dr.
AA, BB) Towel Ensemble. Cotton terry; wh ite background. Fringed ends. Wash Mitt. Dr. Seuss design. Bath Towel. 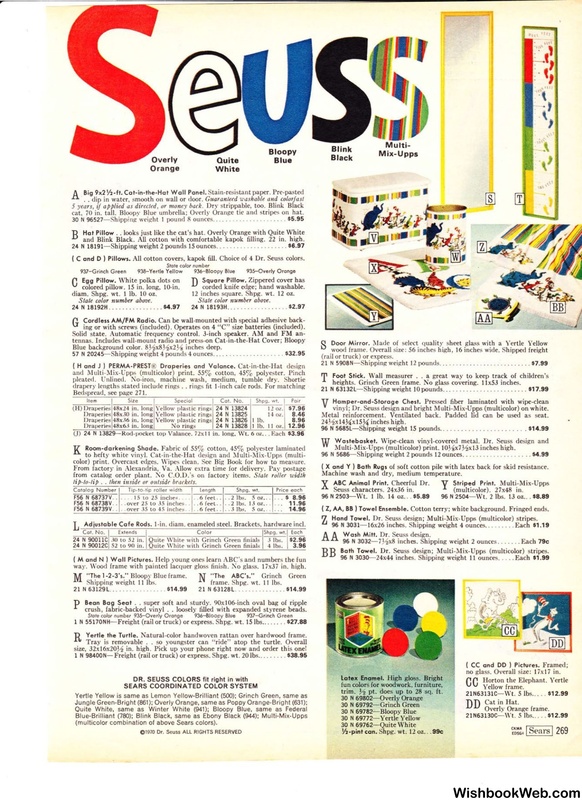 Dr. Seuss design; Multi-Mix-Upps (multicolor) stripes. pt. does up to 28 sq. ft .
no glass. Overall size: 17xl 7 in.